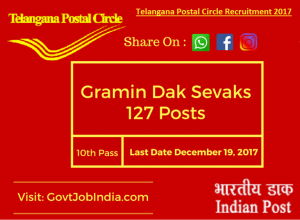 Telangana postal circle has released latest recruitment notification for the post of Gramin Dak Sevak. 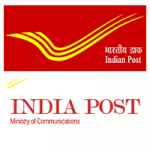 The total 127 telangana post office vacancies are available for this post and last date to apply online is December 19, 2017. Given the criteria for the post, candidates who have passed 10th grade from State /Central Govt approved state boards can apply for this post. Telangana postal department is recruiting eligible candidates who are looking for a Govt job opportunity in Telangana for the postal department and earn fair. Candidates who are interested can log in to their website portal (http://appost.in/gdsonline) to fill application form and apply online. The age limit for the post is 18 years old to maximum 40 years old. Age relaxation details are listed below. The selection procedure will be done according to the merit list of the candidates. The below details will guide you about the application for the post and the eligibility criteria as well as mandatory documents needed for the Telangana postal circle recruitment. Education Qualification: The postal circle of Telangana recruiting candidates must have passed 10th standard from a recognized university or board. The given criteria are important for the post of Gramin Dak Sevak. Should have a passing certificate of matriculation /10th standard from a recognized board or institution. Preferences will be given to candidates acquiring higher number of marks. Should have a good amount of basic knowledge in computer and should also have a computer certificate from a recognized institution. The criteria also applies if he/she had a subject of computer in higher classes. Age limit: anyone between 18 years of age and 40 years of age can apply for the post considering the number of openings and age relaxation. Selection procedure: the selection will be done according to the merit for Telangana Postal Department. The preference will be given to candidates with higher marks obtained in his/her 10th standard. The marks division will be done according to the average aggregate marks. In case of similar percentage the merit order would be considered according to the DOB, SC male/female, ST male/female, OBC male/female etc. apart from the aggregate marks computer knowledge will also be taken into account. Candidates interested to apply have to register online. You have to obtain the registration number. You have to log in with the id and password. Fill in all the details in the form. Upload all the mandatory documents. Get a print out of the form. Application fees: applicants need to pay INR 100 for general and OBC category and No application fees for SC/ST/PH/Women candidates.